No nonsense audio for your gaming needs. Sennheiser is one of the biggest headphone manufacturers around, and although one would normally associate the company with high end audio at super expensive prices, there are more budget options available. 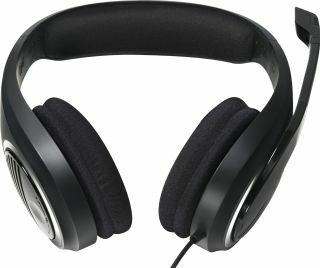 The Sennheister PC 320 is a set of open-back design headphones with built in microphone which gives you good quality audio at a decent price, and right now they're down to £40 on Amazon. In terms of sound quality, it's lagging behind our favorite gaming headset, the HyperX Cloud Revolver, but it is over half the price right now. The build quality is lower too, however the plastic does make for a nice light headset, useful if you find bulkier headphones get warm and heavy after a long gaming session. You don't get a plethora of features either, but you do get some basic volume controls, and the microphone is of good quality. Amazon says you're saving 43 percent on the Sennheiser PC 320, but the price usually hovers around £60 - £65, rather than the full RRP of £70. You're still saving about £20 over the normal price though. It's not the highest quality or the most feature packed headset on the market, but getting a solid Sennheiser headset for just £40 is a decent deal.